You are here:Home Tips Do singing lessons on Skype work? Skype singing lessons. We’ve all heard of them, some of us love them and some people hate them. We think Skype singing lessons are a great alternative to in-person lessons if you can’t make it to a studio; both of us take lessons via Skype with our own teachers in other countries. We also both teach singing lessons via Skype to our students in the UK and Europe. There is very little that singing lessons on Skype cannot achieve, if delivered by a competent teacher to a student willing to learn and improve – most things will be exactly the same as an in-person lesson. The biggest difference in taking Skype lessons is that you will be required to sing acapella, since the standard time-delay makes it impossible for the teacher to play full scales for you to sing to. However, this should not be viewed as a bad thing – actually it’s very useful! Yes, you can have singing lessons in your own home, at school or college, or even in the studio if you have one! As long as you can connect to the internet, then you’re free to take a Skype lesson wherever you like, whenever you like! Although, we don’t recommend having lessons anywhere that is particularly noisy, or where you will disturb other people. You can study with teachers from anywhere in the world! How cool is that? If you find a teacher you like in the USA, but live in the UK, then that is no longer a problem. Get booked onto their schedule! Tom and Laura both take lessons over Skype for their own voices, with teachers from the USA, Canada, Austria and Germany to name but a few countries. Skype gives you access to many good teachers around the world, what’s not to love? Taking Skype singing lessons will help your musical ear, since you will have to sing a-cappella during your lesson. This will improve your general musicality, and ability to pick notes out of songs by ear. It’s an all-round good thing to work on, so it’s a big bonus to taking skype lessons! Time zones, lesson times and changes, oh my! You will need to be absolutely sure that you get your time zone differences right! For example, Las Vegas is normally 8 hours behind the UK. So, a 12pm lesson with a teacher in Las Vegas will be at 8pm in the UK. However, you’ll also need to be aware of the Daylight Savings Hours, which can add an hour onto the time either way. Be absolutely sure when you book a lesson with your teacher that you are both talking about the right time. You don’t want to show up an hour early or an hour late for your lesson because you miscalculated your time zones! Delays in either sound or video, or sometimes both. Sometimes Skype can be a pest, depending on the time of day, traffic through the site and the internet usage in your area. You can sometimes get a few seconds delay in either the sound or the video, which can be annoying. Skype is normally a half second or so behind real-time, which is normal and can be worked through without too many problems. As soon as the delay gets bigger than this, it can start to affect the quality of the call. Unfortunately, there isn’t a lot you can do about this – you can try hanging up and calling again which sometimes works, but often you just have to deal with it. If your internet cuts out, that’s it! If your internet cuts out mid-lesson, then you’ll be scrabbling around to reconnect it so you are able to finish the lesson. Unfortunately, if this is a fault on the side of the student, the time is not likely to be made up at the end or at another time. It is your responsibility to ensure that you have a good enough internet connection to support a video call. However, if it is a fault on the side of the teacher, a good instructor will make up the time lost if it is significant enough. Our Top Tips to get the most out of your Skype singing lessons! Make sure you have a GOOD internet connection. Public wifi spots are going to be worse for connection than your home internet. Make sure you have a device able to support both video and audio at the same time. Your teacher will need to be able to see and hear you, so you get the most out of your lesson. Ensure your device is plugged in, or running on full battery at the start. Nothing is more annoying than the power running out mid-lesson, or you having to go fetch the cable to plug it in. Have your lesson somewhere you are not likely to be disturbed. Wear headphones so neither side experiences any distortion of the sound. Install a good Skype call recorder on your device (like this http://www.ecamm.com/mac/callrecorder/ one) so you can listen back to the lesson to practice and reflect. Be ready and waiting 5 minutes before your lesson so you can get started straight away – just like you would be at a studio. Have a glass of water within arms reach of where you are taking your lesson – it will avoid any unnecessary, lengthy gaps where you have to run off to the kitchen to get water. Have your device at eye level or higher so you are not straining or bending your neck to be able to see the screen. So, we think singing lessons on Skype are great if it is impossible for you to travel to that specific teacher’s studio. However, nothing can really beat going to a studio for the full experience of a voice lesson. We love the freedom that taking Skype lessons gives us, but every time one of our teachers is within travelling distance, you can bet that we’ll be there snapping up their allotted times! 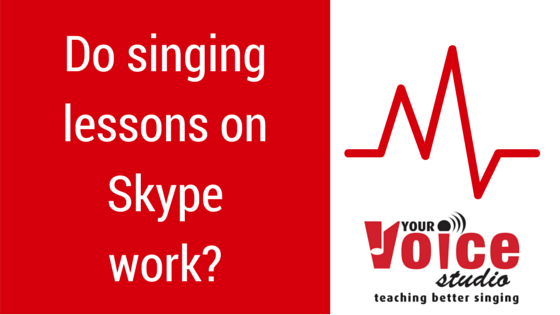 What are your experiences of Skype singing lessons? Do you love them or hate them? Let us know in the comments below, or connect with us on our social media channels!